Honey comb belts are widely used for conveying the product in freezing, backing, dying, cleaning etc in India. Its surface is flat and is very easy to clean and maintenance. 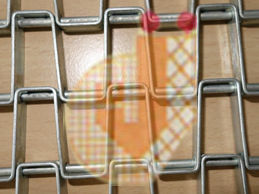 Honey comb belts are widely used in application for food. Backed by a modern infrastructural base, we have established our presence as the most reliable firm of Honey comb Belts. Meanwhile, Honey comb Belts are easy to maintain just replacing the section that is damaged or worn down. - Food baking, furnace, cooling and freezing, etc. - Acting as matting and drag mats. We are amid the noticeable providers of a comprehensive assortment of Honey Comb Belt.